Welcome to Briggs Land: nearly a hundred square miles of rural wilderness, representing the largest anti-government secessionist movement in the United States. 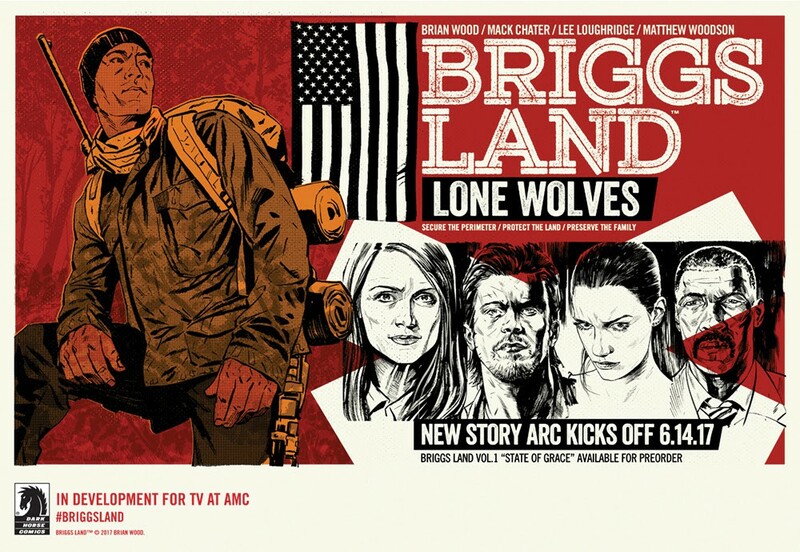 The battle continues in the second series: Briggs Land: Lone Wolves, featuring New York Times best-selling writer Brian Wood (The Massive, Rebels, DMZ, Channel Zero) and interior artist Mack Chater (Ashes, Six), and colorist Lee Loughridge (Fables, Hellblazer). Matthew Woodson and art legend Kim Jung Gi lend their respective artistic skills to the cover and variant cover. The first issue Briggs Land: Lone Wolves finds Isaac Briggs seeking the solace of the hiking trails around Briggs Land as he comes to terms with his past military service in Afghanistan. When two random backpackers accidentally wander onto the Land, an innocent situation quickly turns dangerous and threatens to expose the Briggs family to the media. Brian Wood is currently adapting Briggs Land for AMC TV, serving as writer and executive producer, with producing partners A24. The first issue Briggs Land: Lone Wolves (of six) goes on sale June 14, 2017.